I’ve been doing a lot of reading around about Tough Mudder. 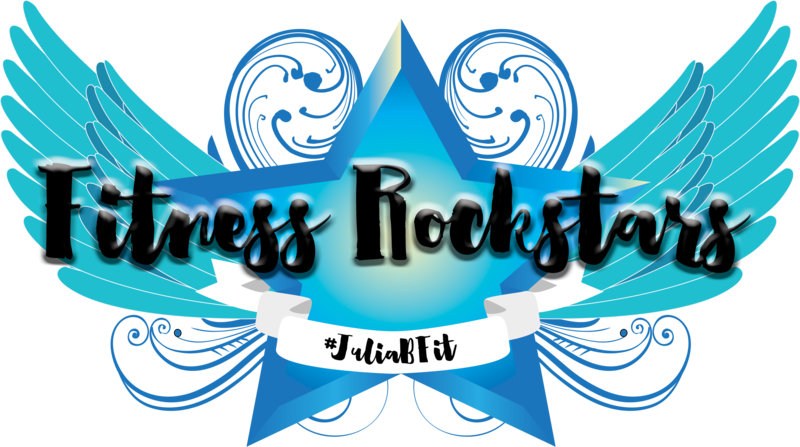 Since I’ve never done an obstacle or mud run I’m trying to get as many views as possible about how best to prepare, what to expect on the day, what to wear etc. A consistent theme in what I’ve read is that pull ups are really good training. 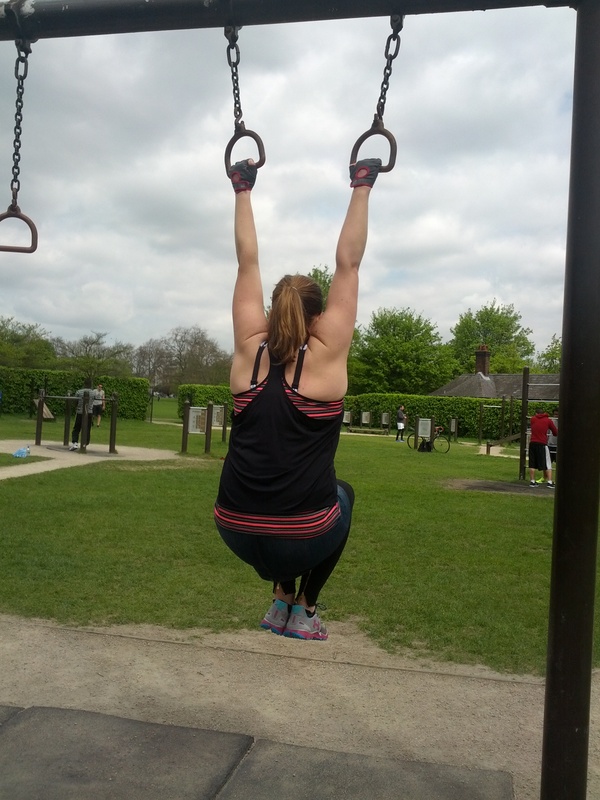 There are a number of obstacles where the ability to support or pull up your own body weight will come in very handy. 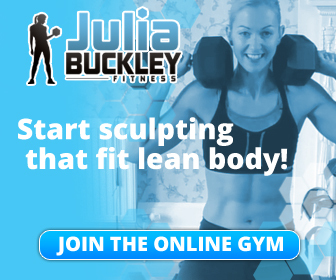 I don’t belong to a gym and I don’t have a pull up bar at home (yet) so I started researching places online where I might be able to go and try some out. 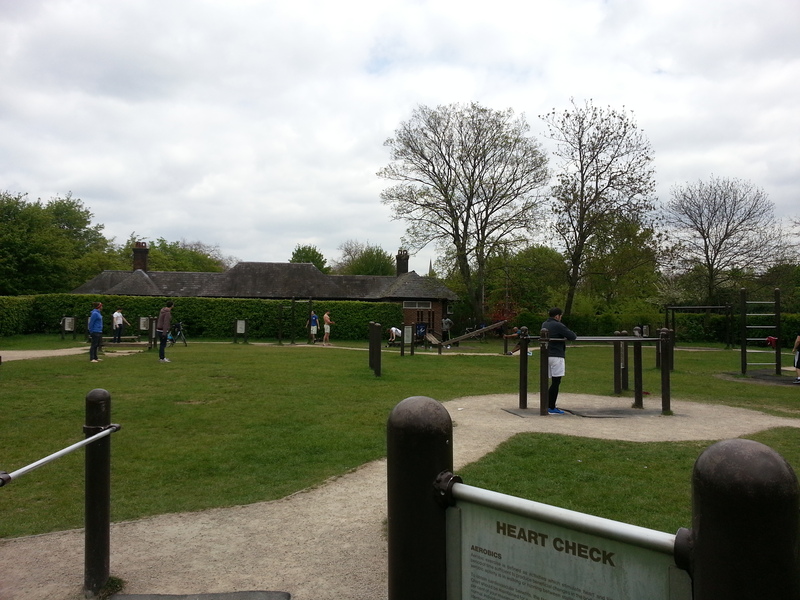 I came across a couple of posts that mentioned the Trim Trail in Primrose Hill – an outdoor circuits area which is free to use. So yesterday I took myself over there to check it out. It’s a reasonably big area with lots of different stations and an explanation to what to do at each. When we arrived I quickly realised that I was the only woman in there – most of the stations were being occupied by burly looking men. I was glad that Mr J was with me or I probably would have felt a bit intimidated. As it was I thought it was kind of cool that I’d come to have a go on some of the boys toys! The actual pull up bars were in constant use while we were there and I wasn’t quite brave enough to stand and queue up for a go. Imagine hassling someone else off the bar only to find out that I couldn’t even hang onto the bar, let alone lift myself up! So I decided to have a go on the rings instead. I realised that this was going to be harder in some ways but figured that it was all good practice. Now although I’ve lost weight I am still quite heavy for my size so I was actually quite pleased to be able to hold myself like this for between 8-seconds a couple of times. 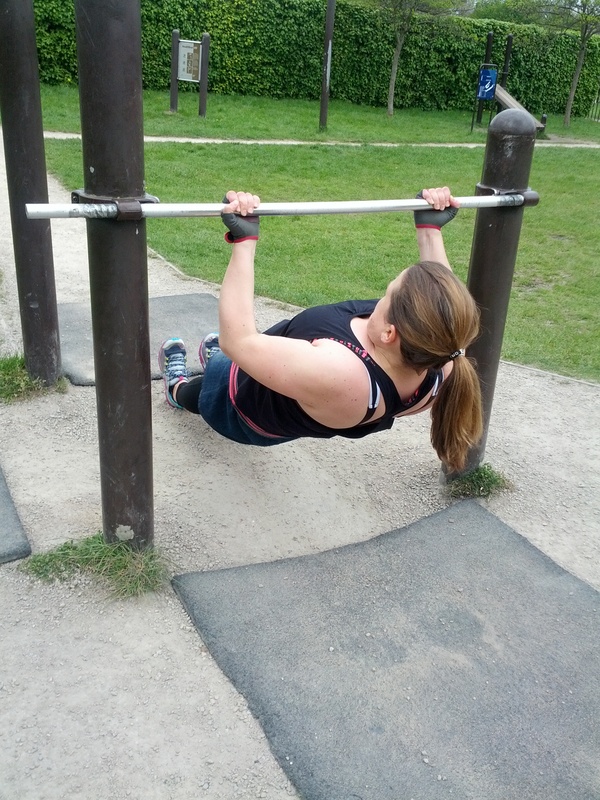 After that I moved onto trying some inclined pull ups – basically using a bar which is quite low to the floor to practice the same movement as a pull up. As your feet are on the ground it takes some of your body weight out of the equation and makes it easier – but it allows you to develop strength in the muscles all the same. I managed 3 sets of 8 reps of these which I was quite pleased with for a first try. By this point my hands were really starting to hurt and I realised that I could do with working on my grip and probably investing in some most substantial gloves for the event itself. 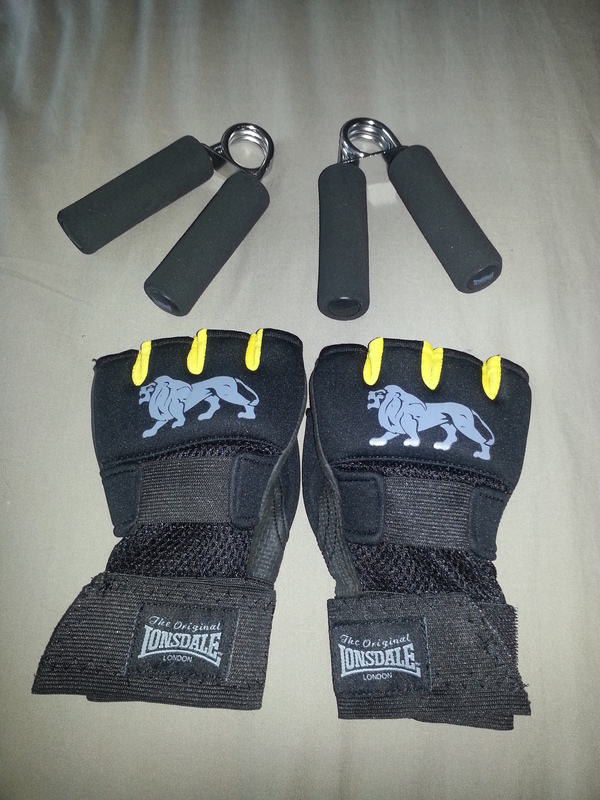 So today as I was having a Bank Holiday Monday wander around Westfield Stratford I popped into Sports Direct and picked up these babies – some grippers to increase the strength in my arms and hands and some boxing gel wraps that have really good grip and padding on them and are also designed for weight lifting. I’ve also bought some new trainers for my training and Tough Mudder day itself. Now I know it seems a bit crazy to spend money on a pair of shoes which are probably going to get trashed, but the fact is I don’t own any trail shoes and I am not prepared to trash any of my lovely Kinvaras. 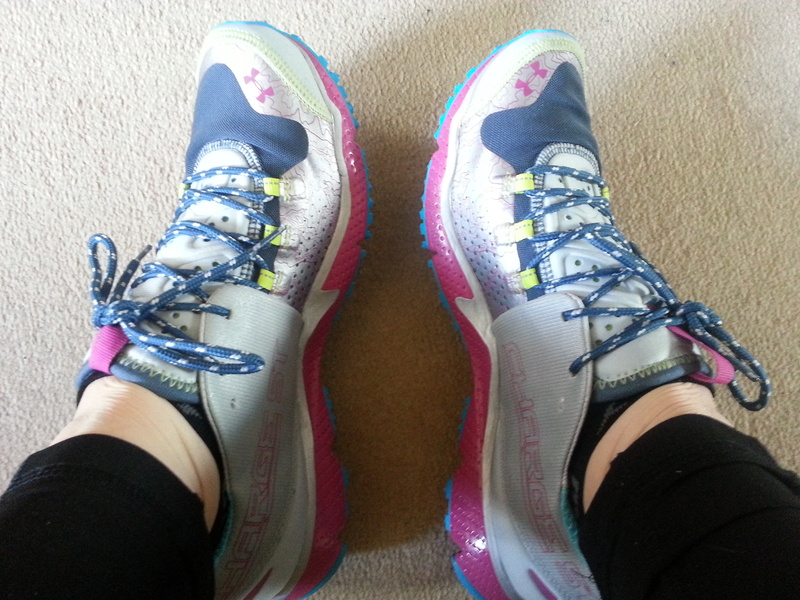 So, having done my research I bought some UnderArmour Trail shoes which several people have tried and tested at Tough Mudder races. 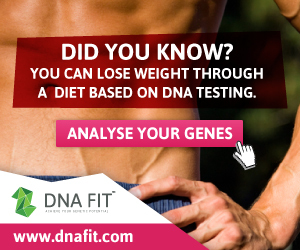 Apparently they stand up to the test well and don’t need to be donated to charity afterwards. We’ll see. They’re going to get their first taste of mud this weekend coming and Julia as I have signed up to take part in the Chiltern Warrior run – a wild obstacle run over 10K. I’m hoping that completing this will build my confidence but also give me some pointers to focus on for the rest of my training. Watch this space for the race report! Great post. I’m doing a Spartan Sprint and a Warrior Dash. It seems to me that core and upper body strength training can only help when training for a Marathon. and competing helps me stay motivated. I wish I had a fitness course like that near me. Best of luck! Thanks! I agree that core and upper body strength can really help with marathon training. It’s something I neglected for my first marathon but I won’t be making the same mistake again. Good luck with your events – they sound like fun!